It is a common problem, it is believed that one in every 5 women has to face this problem.Well, this is not a very serious problem but in some cases it may be a problem.Fibroid are the tumors in the uterus,which have very little chance of cancer.This is a uterine growth which is a benign condition. In this stage,one in 10 thousand women is at risk for cancer its depend on size and condition of fibroid. The women who have seen estrogen are very high,they have high risk of fibroid and cancer.Most of the situation is found in those women who are suffering from obesity, due to hormonal changes. Many times it has been observed that during fibroid in pregnancy,it begins to grow with the size of the baby and begins to put pressure on the bladder,thereby causing urination problems.Sometimes the condition may be the cause of miscarriage or premature labor pain when the condition is more severe. If their size increases then they begin to put pressure on the blood vessels due to which swelling in the feets and there is pressure on the tube connecting to the urinary bladder which is not suitable for kidney. It also depends on the size of fibroid from small to large.In many cases during pregnancy fibroid also increases with the pregnancy.In the early months of pregnancy they grow faster,many women have too much bleeding and severe pain,many times they have to be admitted to the hospital too. Now with the help of modern technology,doctors can ensure the fibroid does not affect the baby's by looking inside the uterus.Now with ultrasound doctors can keep a complete eye on fibroid and infant development.In many cases there are circumstances in which birth canal blocks due to which no normal delivery is achieved,then the help of c suction is taken.If fibroid is too big then they are removing them because bleeding is high and the uterus becomes weak too. Submucosal fibroid - These are within the bag of uterus.Due to these period bleeding is high and irregularity may be reported in periods. 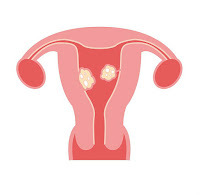 Intramural fibroid - These are on the walls of the uterus and the uterus gets bigger and it has problems like pelvic pain,waist pain and high bleeding. Subserosal fibroid - It is externally outside the wall of the uterus and grow outside. There is no special problem in periods but often there are complaints about pain in the waist and sometime in pelvic. Here,we will give you this advice if you are experiencing the above symptoms in your body or have any problems since long time then get the best doctor and get the right advice.Doctors do many tests to check this problem properly,such as ultrasound,lab tests,hysteroscopy, MRI,medications etc. According to your problem the right treatment doctor will tell you.